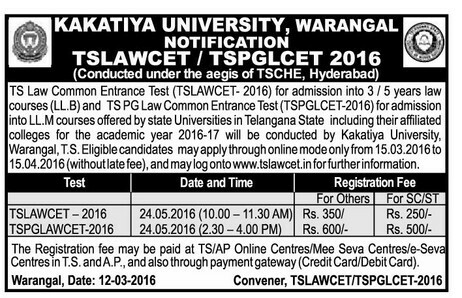 Telangana State Law Common Entrance Test (TSLAWCET 2016) for admission into 3/ 5 years law courses (LL.B) and TS PG Law Common Entrance Test (TSPGLCET 2016) for admission into LL.M courses offered by State Universities in Telangana State including their affiliated colleges for the academic year 2015-16 will be conducted by Kakatiya University, Warangal. How to Apply: Eligible candidates may apply through online mode only from 15.03.2016 to 15.04.2016. TSLAWCET:Rs. 350. for others and Rs 250 for SC/ST ,The Registration fee may be paid at TS/ AP Online Centers/ Mee Seva Centers/ e-Seva centers in T.S. and A.P., and also through payment gateway (Credit card/ Debit card). TSPGLCET:Rs. 600. for others and Rs 500 for SC/ST ,The Registration fee may be paid at TS/ AP Online Centers/ Mee Seva Centers/ e-Seva centers in T.S. and A.P., and also through payment gateway (Credit card/ Debit card).